Lots of trees and well-manicured grass around man-made lake with 300' fountain. Multiple pin placements. Maps at 1st tee. Circular concrete tees. Shea Blvd. from Phoenix east to Fountain Hills, left on Saguaro Blvd., 2 miles to park. Park by playground. 1st tee on south side of lake. From East Valley; AZ 87 north 11 miles, left on Shea Blvd., right on Saguaro Blvd. 2.6 miles to a right on El Lago. Awesome course with beautiful views! Water does come into play on several holes, but there are alternate tee pads and safe options on each of them. Great tee signs that give you the info you need and are easy to follow. 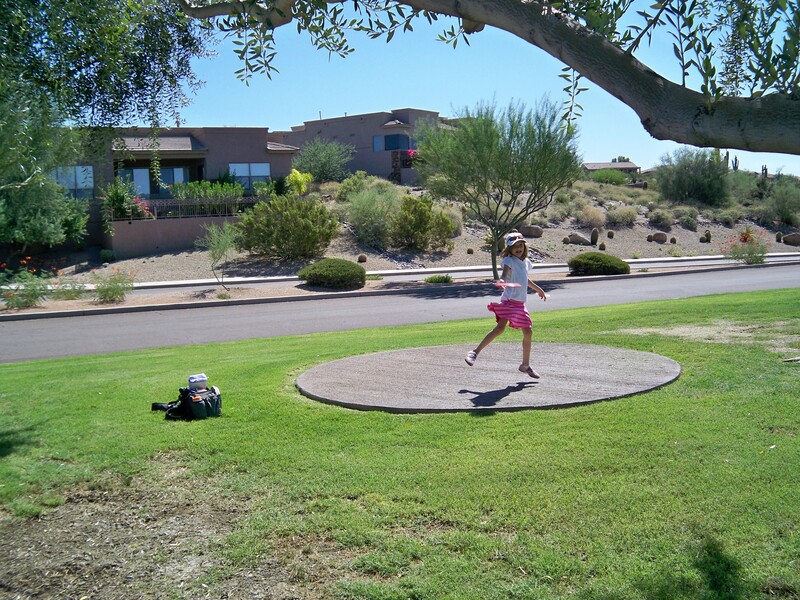 Great course that doesn't beat your disc up like other Valley desert courses do. Water hazards are on quite a few holes, and I tend to stay far away, b/c once it's in the lake it's probably gone. Playing around sunset is the best. Beautiful scenery. 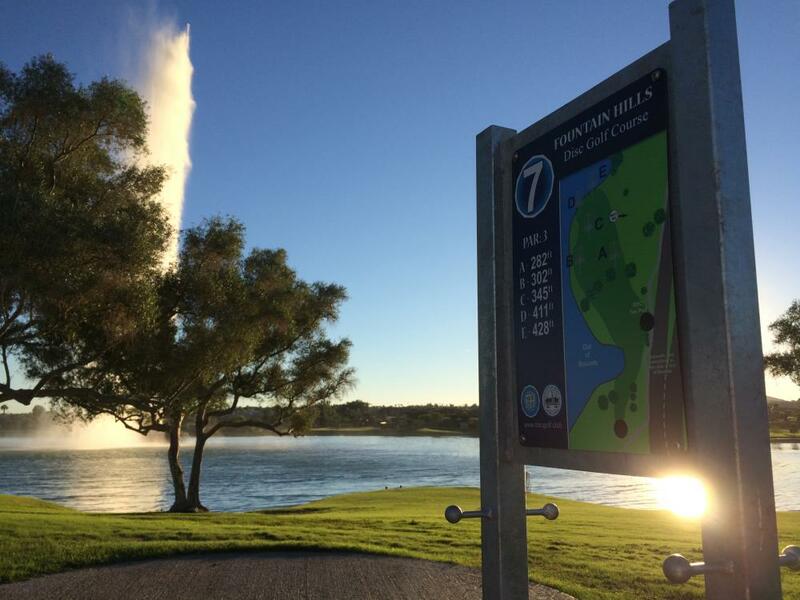 The Fountain Hills course has had major upgrades on 2014. 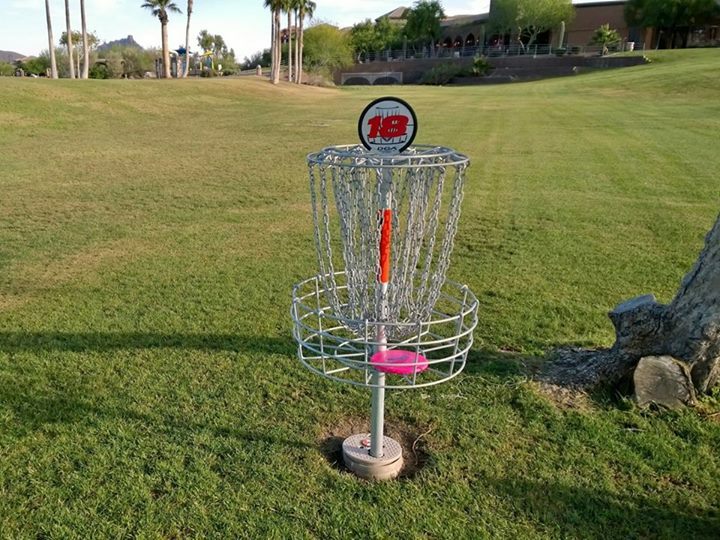 Twenty-four Mach X baskets, new 12 x 18 inch tee signs that are first class, additional tree plantings, and most holes with multiple basket location options. 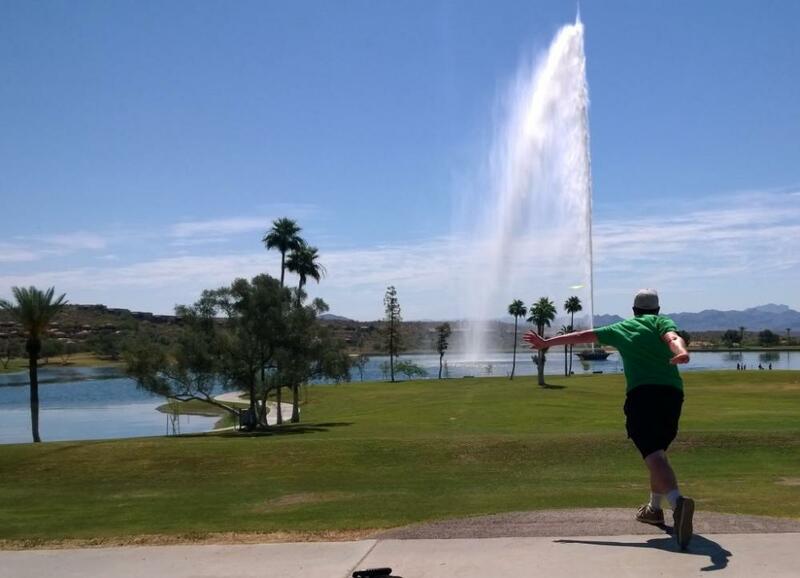 The course is one of the most beautiful, most iconic with the big fountain, and most fun of any course I've played. Almost every hole offers a risk/reward tee shot. 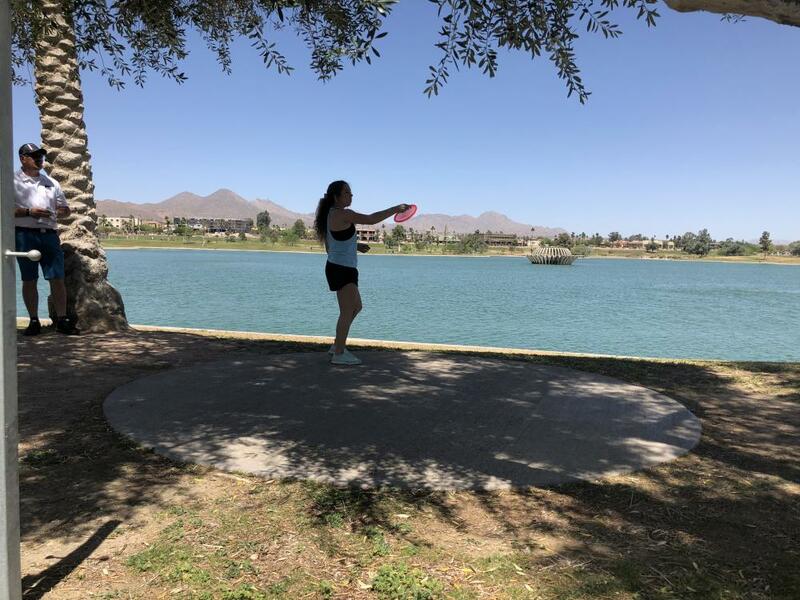 Do you throw to the basket right next to the lake for a deuce or do you play it safe and go for a par? You'd be hard pressed to find a better course. Beautiful course that will challenge you to throw a wide range of shots. The FHDGC continues to work with the city to make some great improvements. A must play! By far one of the premium courses in the world. Earlier this year we got new Mach X baskets (pretty sure Dan Ginnelly , Jeff Burns, Spinners, etc. made his happen.. thank you!). 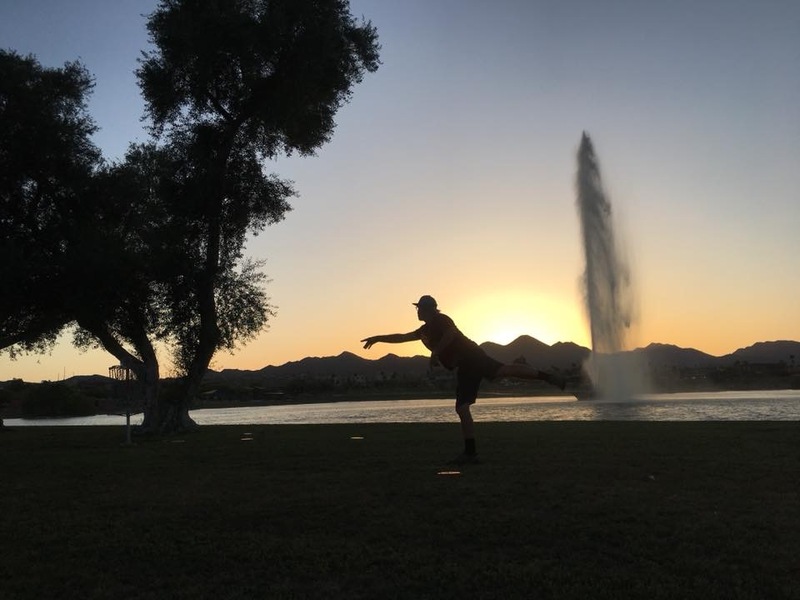 The Fountain Hills Disc Golf Club has been putting in a lot of hours to upgrade the target posts.. and with help from the players, are very close to installing new tee signs. Lot of big throws.. lot's of risk (water).. lot's of fun. There is a Friday afternoon random doubles league.. and incredible support from the town to make this the (underlined) Disc Golf Course! For a wide open course this is by far one of the most challenging I've ever played. Accurate, consistent play will leave you feeling happy all over if you can keep your discs out of the water. This is not the best course for beginners. 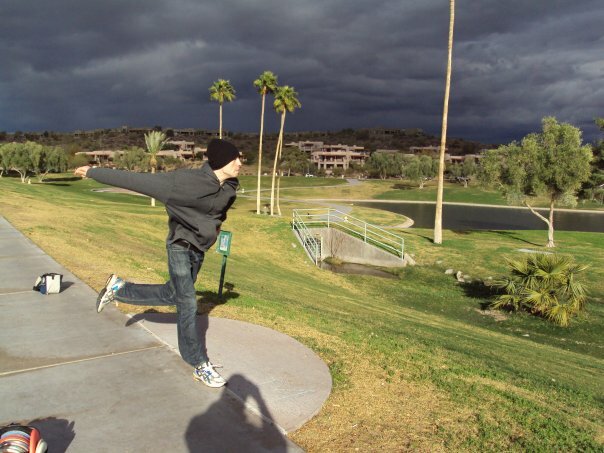 Baskets are easily missed with water being the outstanding obstacle to ruining your round. 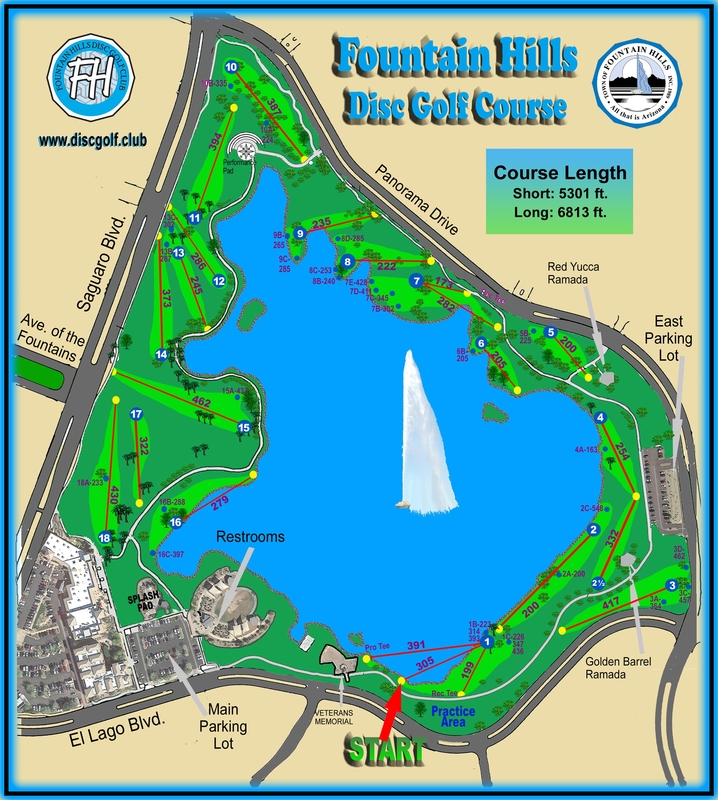 It is by far the most picturesque course you'll every encounter as the course plays around the lake and fountain. Most other park visitors rarely interfere, but there are exceptions and a little common courtesy goes along way to an enjoyable round. Shoot close to par and you should be very happy. This is an extremely pleasant course. Great layout, lots of "civilians", but the design does all it can to keep them out of play. Birdies are hard to come by especially on the back 9. Bring floaters or throw away discs as the water often comes into play. I say bring hand sanitizer as well because owners pick up after their dogs but no one picks up after the numerous geese. Water fountain, bathrooms, and local businesses off 18. One of my favorites in the area. interesting course surrounding a small lake. lots of walkers throughout the park during my round which i found annoying after awhile. the course is in extreamly great shape and well manicured with very difficult tee shots and holes near water making it tricky.. fun course.